The Yonex Nanospeed 9900 outstands thanks to its incredible speed. If you want to execute the fastest and most lethal swings of your life, then this racket is perfect for you. If you are a lover of speed, then this racket will be the perfect match for you. 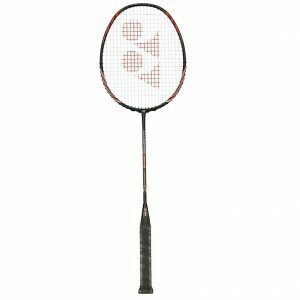 Coupled with its amazing maneuverability, this product by Yonex is one of the best in the market. It has many benefits to offer you. Not for nothing it’s used by many professional players. But it’s enough for now, let’s check all about this racquet. 2 Design and Construction: What Makes It Awesome? Ultra Fast. This is where this racket shines, thanks to its ultra-fast head speed. Great Power. It’s very powerful despite being a head-light racket. Superior Defense. It’s a great choice for defensive-style players. The Nanospeed 9900 puts at your disposal a great blend of power, superior speed and excellent defense. And let’s not forget about its excellent maneuverability. Without any doubts, one of the best rackets fabricated by Yonex. If you are a lover of speed, then this racket is perfect for you. If you want to learn more about this racquet, then you are invited to read a more detailed review right below. Design and Construction: What Makes It Awesome? First off, this badminton racket price is justified by the amount of cutting-edge technology it includes. This racquet has been engineered to have a superior performance, and you will see why as you keep reading this review. The design of the Nanospeed 9900 is superb. It’s almost fully black, accompanied by some red along with white and orange stripes which make it look beautiful, elegant and lethal. More repulsion power and better stability. It’s all due to the X-Fullerene used in the resin, which increases binding forces and brings you more stability (+15%) and more repulsion power (+5%). Fast, strong and light-weight. It’s all thanks to the bond between carbon nanoparticles and fullere achieve by Yonex. As a result it brings you a light-weight racket which is faster and stronger than conventional choices in the market. Box Frame + Aero Frame. This superb combination also found in rackets like Arcsaber 11, brings you a smoother and faster swing along with a more powerful hitting. The best from both worlds. New Built-in T-joint for superior accuracy. By increasing stability of the shuttle on the string bed and reducing torque, you will get better and more accurate shots. This feature can also be found in the Voltric 70. Better gripping thanks to its Control Support Cap. Want better gripping and superior maneuverability? Then thanks to this feature you will get so, which will make you a better player. It shares this feature in common with the Arcsaber Z Slash. Superb shock absorption and great stability. If you are really tired of trembling racquets, then you won’t have to worry about it with the Nanospeed 9900, because thanks to its built-in solid feel core you will avoid this problem. Its New Grommet Pattern makes stringing better. Its revolutionary grommet construction brings the racket more grommet holes, which in return improves the performance of the stringing bed. More repulsion more, better feel and more stability. What else could you ask for? And finally, as usual, it comes with an isometric frame shape which makes it easier for you to hit the sweet spot consistently. As you can see it’s equipped with the most advanced technology, and hence, it’s one of the best rackets in the world nowadays. It’s about time to review its performance in the game. Let’s check the aspects where this racquet really shines. Thanks to the construction and design of this racquet, clears go far and without much effort at all. It may not hit as hard as a Voltric 80, but it does a very decent job. You could not expect less from this racquet. In this aspect it’s pretty good. With backhand serves you will get decent power and plenty of accuracy, whereas with forehand serves you will get more power and plenty of accuracy as well, especially with high-serves. This racquet is excellent in both defensive and offensive drives. But what makes it excellent for defenders is that, thanks to its head-light balance, defense gets much easier and practical thanks to the fast reactions and excellent accuracy. You probably know how hard it is to defend net kills, but with this racquet will get much easier. When it comes to defensive net play, this racket really shows its maximum potential. You can also play offensive shots in the frontcourt with ease. Net kills are excellent with this racquet. This is one of the best rackets ever created. Its superior technology and design make it an excellent acquisition for any player out there looking for the next level in performance.